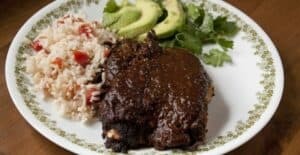 Homemade Mole Sauce is a long project, but the results are pretty outstanding. I used my version to make delicious chicken and cheese enchiladas. 1) Add all the stock ingredients to a large stock pot and bring to a simmer. Simmer, partially covered, for 2-3 hours. Strain stock and set aside. Discard veggies. Let chicken cool for later. 2) For sauce, roast dried peppers at 350 degrees for 8-10 minutes until fragrant. Then add peppers to a bowl with 2 cups boiling water. Let side for 30 minutes. 3) Toast spices in a large skillet over medium heat for a few minutes until fragrant. Then grind spices into a powder and set aside. 4) Roughly chop veggies for base and roast for 15 minutes at 350 degrees. 5) Add roasted veggies to a blender with 1 cup chicken stock and blend until smooth. Strain and add veggie base to a large pot. 6) Cook nuts in melted lard over medium heat until they are lightly browned. Then add raisins and cook for another minute until they are soft. Be careful not to burn raisins. 7) Add nuts and raisins to blender with 1 cup stock and puree. Once smooth, add to veggie base. 8) Sautee diced banana (or plantain) in lard along with corn tortillas until lightly browned. Then add to blender with 1-2 cups stock and blend until smooth. Add mixture to sauce pot. 9) Add another two cups of chicken stock to sauce pot along with ground spices and chocolate. 10) Bring sauce to a simmer and simmer, on medium-low heat for 90-120 minutes, stirring regularly. 11) Season sauce with salt and pepper and serve over enchiladas or chicken or turkey. 12) Extra sauce will keep in the fridge for two weeks or you can also freeze it for later. This delicious recipe was brought to you by Macheesmo. Read the full post at https://wp.me/pkSYO-7I2.